Mezzanine flooring doesn’t usually cover an entire floor of a building, however, they can impact the utility and efficiency of the building as a whole. Mezzanine flooring can increase the space available in your building. Mezzanine flooring is a brilliant and effective solution without having to undergo a larger building construction project which could be a lot more costly and time-consuming. Mezzanine flooring is extremely lightweight and is also very versatile. It is also highly affordable and will be achieved quickly. Mezzanine flooring can offer you endless opportunities but there are still a few considerations you will need to address before constructing your mezzanine. These considerations will allow you to receive the right solution for you and your workspace. QA has provided you with all the things you should consider when purchasing your mezzanine flooring. If you have any questions on our mezzanine flooring please contact us through our website today. Mezzanine flooring can be fit for multiple purposes such as retail, storage or an office environment. You can have it constructed to increase the storage of your workspace, for design purposes in a retail environment, just apply additional space to your building or all of the above. Whatever the purpose make sure these are communicated through the manufacturing company. QA likes to know this information so we are able to provide you with the best service and quality to best suit your needs. Some mezzanine flooring has to be fire safety approved while others do not. It is imperative that you speak to qualified professionals because they will know what is best when it comes to building regulations. They can advise you on if your flooring will warrant a sprinkler system. You must have a fire safety strategy in place as it is critical for your mezzanine flooring to meet health and safety rules and regulations. Meeting these rules and regulations should prevent spreading and will allow people enough space and time to escape without injury in the unfortunate event of a fire. Some mezzanine has automatic fire detection features such as emergency lighting on the undersides. Other features include firewalls and column casings. As heat rises in a room, mezzanine floors can, unfortunately, become quite hot. For this reason, you may want to install insulators to ensure the floor does not absorb too much heat, as well as proper ventilation for the building. Keeping your mezzanine flooring cool is imperative to keeping your office cool and will greatly increase the satisfaction of your staff and your valued customers who use it. Size is a very important aspect when it comes to mezzanine flooring. Make sure the size of the floor where your structure will be placed, the size of the room and the size of the products that will be placed on or under the flooring are all taken into account. You must remember that one of the purposes of the mezzanine flooring could be to save space so make sure you leave measuring everything down to the professionals in order gain additional space you require in the long run. Handrails are very important as a safety feature for your flooring and ensure that all exposed edges are safe and secure preventing injury or fatality. All edges must have handrails to protect stock and workers. Depending on the purpose of the flooring and the design as a whole you may opt for a feature rail for design purposes or an industrial handrail for more of a warehouse workspace. You are more than welcome to ask for a customised handrail which could fit your companies colours and branding. Staircases just like handrails have to fit in with the whole structures design and purpose. The staircase must also integrate with the companies branding as well as the building overall. They can ensure safety, ensure a fire escape route and contribute towards an aesthetically pleasing workplace. Please remember that even though you maybe be using the flooring for storage doesn’t mean you shouldn’t design them. Making everything match your companies colours and branding will give your building a more professional and aesthetically pleasing. There are different factors you need to take into consideration when designing your mezzanine flooring. For examples retail business’ will have a lot of stock and mezzanine flooring will help expand this storage space. This allows business’ to open up a large space underneath the flooring and become more attractive to customers walking around your shop. If you use your mezzanine flooring to display products we recommend you keep it as decluttered as you can in order to make it more appealing to potential customers. If you are contemplating getting mezzanine flooring you should always consider accessibility and making the most of your space. Consider adding staircases or lifts to your design to cater for more people and to make it easier for shoppers. Mezzanine workspaces come in a number of stylish designs which are also spacious, making them a very attractive place to work. Giving your workspace mezzanine flooring will allow your office to have more space, which will allow your workers their own individual space while still being able to work as a team. 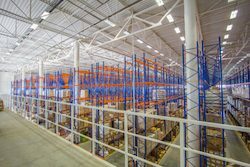 It could be the case that you are considering mezzanine storage which will allow you to expand your storage space to hold more stock or equipment. Make sure to keep the design consistent to keep it professional. Sometimes having mezzanine flooring that doesn’t fit with the design of your building can be inevitable. There is a solution though you could look to locate the flooring at the back of your building where design is less vital. That way, you will still receive the benefits of the mezzanine flooring behind the scenes of your business. space and apply our expertise to make your envision a reality. We are an independent company with a wide range of resources and technical knowledge which you can take advantage of. Our approaches adapt to the nature and budget of the job creating the perfect outcome for you. In both design and installation, we care about detailed planning and will make sure your project runs as smoothly as possible and is completed on time and within the budget. If you would like more information on any of our services please contact us on our website today.